Bring your project, knit and share ideas with others. Get assistance with problems you're having with your current project. Unable to attend the Drop in ? Want individual help with your work-in-progress? Call us to set up a private lesson ! We'll schedule your lesson for a mutually convenient time and you will get one-on-one instruction to help you along. hour session, you will become familiar with all of the skills needed to create a beautiful scarf. Then, learn how to make your scarf into a cowl! Techniques: Casting on, the knit stitch, fixing mistakes, casting off, fringing, and (time permitting) color changing on rows. A perfect project to bulld on skills from the scarf class. Take it to the next level, learning to read a pattern, and seam with ease. All materials are included in this class. Techniques: A review of casting on, the knit stitch, introducing the purl stitch ,and seaming. introduction to knitting in the round, reading instructions and finishing techniques. Techniques: Unlocking the mystery of gauge (knit to fit), introducing the purl stitch, knitting in the round, decreasing stitches, working with double point needles and weaving in ends invisibly. Warm mitts for the winter…a small project and big learning experience! Want to make fingerless mitts? We'll show you how! Techniques: Master the purl stitch, ribbing, picking up stitches, decreasing, increasing & finishing. Does the idea of knitting socks intimidate you? Learn the basic skills of sock-making including knitting in the round on double pointed needles or on two circular needles. Techniques: Knitting in the round on double pointed needles or two circulars, casting on for circular knitting, turning a heel, kitchener/grafting stitch. Learn the basics of crochet as you make a scarf for the season! Techniques:Foundation chain, single crochet (sc), half-double crochet (hdc), double crochet (dc). Take your crochet skills to the next level while creating a beautiful artpiece. 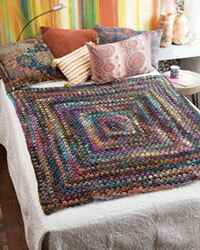 The use of the new Noro Ito yarn simplifies the design process. Each ball contains 32 color changes in one ball making your project an artistic creation without any design planning. Techniques: Working crochet in the round, double crochet, increasing, reading directions for understanding. Using just a drop spindle, some wool roving, and a little bit of momentum, you can create your own one-of-a-kind yarn. Learn to spin yarn on one of our spinning wheels to help you decide what kind of wheel suits your needs, and learn all the basics! REGISTRATION: Payment in full is required at time of registration. Class fees do not include materials, supplies or patterns unless specified. Yarn for classes must be purchased at The Yarn Barn. Payment for classes may be made in person, by mail with a check/credit card number, or by phone with a credit card. If you cancel within two weeks of your class date, half of your class fee will be refunded. Should you cancel within two days of the class date, we cannot refund any part of the class fee. The Yarn Barn reserves the right to cancel or change the date of a class, in which case, you may request a refund or apply the fee toward a different class.